In a large saucepan, heat the oil. Add onions, red pepper flakes and garlic and cook over medium-low heat until the onions are translucent, about 5-8 minutes. Stir in tomatoes, breaking them up with a spoon. Cook about 10 minutes then add basil and canelli beans. Stir and continue to cook over medium heat for an additional 10 minutes. Serve over pasta. I had this can of canelli beans in my cabinet for almost two years. We even moved with it this past July. I think I bought it to make some sort of bean dip or maybe escarole soup but it's all a bit fuzzy now. Anyway, I had read an article that mentioned a tomato-canelli pasta dish and thought I'd attempt my own version. I was pleased with how quickly it came together and how tasty it was. 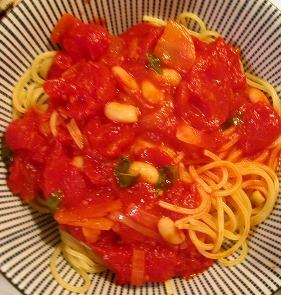 The basil makes the canned tomatoes taste fresh and the beans add a interesting texture/color to the dish. Yummy with some garlic bread and a sprinkle of Parmesan.